In my many-years-long search for the most perfect frosting, I have come across many contenders that seemed to be the one, the true, perfect frosting. But they all eventually disappointed me. Icing sugar buttercream is way too sweet, and incapable of taking on much flavour without becoming runny and unpipeable. Swiss and Italian meringue buttercreams both briefly enchanted me, as they are more butter than sugar based, and so they aren't quite so cloyingly sweet. But as I used them I eventually found both to be way too buttery, and they don't hold much flavouring before splitting. So it was hard to get rich flavours using any of these methods that didn't taste like just sugar or butter. Then I found ermine frosting, sometimes called boiled milk frosting. It's a strange technique, you start by making a strange cooked milk and flour paste that looks an awful lot like wallpaper paste. Then you cool that goop and mix it into creamed butter and sugar, which after extended mixing turns into a super fluffy, silky, not too sweet or fatty, basically perfect frosting. Cooking the flour in milk gets rid of any chalky, flour flavour. It is so well balanced. I think I may finally be ready to settle down and commit to a long-term relationship with just one frosting. I think this is the one. I made this cake for my friend's birthday and I wanted something light and springy to go with Spring. The tangy lemon curd is perfect with the rich, nutty frosting. This is kinda a showstopper of a cake, perfect for a birthday or another proper celebration. Or maybe just because it's springtime? Heat oven to 350°F. Line the bottoms of two 6" cake pans with parchment paper. Combine flour, baking powder, baking soda, and salt in a bowl. Cream butter and sugar together until light in colour. Add vanilla and eggs and beat to combine. Scrape the sides of the bowl and eat again until well incorporated. On the lowest speed, beat in buttermilk. Add flour mixture in three additions. Hand mix with a spatula a little to avoid flour explosions. Scrape down bowl to make sure there are no unmixed spots. Reserve about ⅓ of the he batter for another use (pop it in the freezer for some emergency cupcakes). Divide remaining batter between two prepared 9" pans. Bake 25-30 minutes, or until cakes are golden brown and a toothpick inserted into the centre comes out clean. Cool cakes and run a knife around the edge so they come out of the pan cleanly. Trim off the outer edges and level the cakes, cutting off any domed top portion. Cook milk and flour in a small saucepan over medium heat, stirring constantly until the mixture thickens to a gluey, pudding consistency. Cover pan and cool to room temperature. It needs to be completely cool before the next step or it will melt the butter. Also, if you chill this mixture in the fridge, do not proceed before bring back up to room temperature - a cold mix added to butter will seize and split the frosting. In a stand mixer with the paddle attachment, whip together butter and sugar on medium speed until light and fluffy about 5 minutes. Add in room temperature milk mixture and increase speed to medium-high. Whip until the mixture is smooth and very fluffy, which can take more than 15 minutes sometimes. It may look split or grainy, but just keep on mixing until fluffy and velvety. This always takes way longer than I think it should, so I recommend that you walk away at this point and don’t look at the frosting more often than every 5 minutes. I like to use this time to do some of the dishes I have made or have a snack. Just don’t stare at your frosting getting stressed out. When you have smoothness and fluffiness, add in the vanilla, salt, food colouring and pistachio paste and beat until fully incorporated. If your frosting becomes a little soft and droopy after the pistachio paste is added chill in the fridge for about 10 minutes, and the beat again. Repeat until frosting is smooth and holds a peak. Note on pistachio paste: if you can’t find pure pistachio paste (just ground pistachios, no sugar or anything else) you can make your own. Toast 1-2 cups pistachios until fragrant and puré until a smooth paste forms. Keep in the fridge in an airtight container. In a saucepan off heat, combine all ingredients, combining well. Set over medium heat and cook, stirring constantly. When the mixture is thickened remove from heat, cover, and refrigerate until cool. Mix lemon juice and sugar in a small saucepan over low heat until sugar is dissolved. Cool and store in the fridge. Drizzle lemon syrup generously over the cake layers and let soak in for a couple minutes. Place one cake layer on a 9" cake board if you have it, or a flat plate or cake stand. Cover cake with a very generous layer of curd, it should be quite thickly set so you can really pile it on without oozing over the edge. Leave a thin border of uncovered cake around the edge to make space for squishing when you add the next cake layer. Sandwich next cake layer on top and cool in the fridge around 15 minutes to set up, to help the curd not ooze out into your frosting. This is a good time to finish make the frosting. Frost the chilled cake quickly all over with an offset spatula, making sure to cover all exposed cake. Adding more frosting as you go, use an offset spatula, or bench scraper to tidy up and give the cake some nice clean angles. Chill again for 15 minutes and add a generous second layer of frosting, using the bench scraper to make smooth, straight sides. Chill again about 10 minutes, and decorate as you like, I used a sprinkles and chopped pistachios sprinkled over a little micro-forest of piped poofs and rosettes. But you do whatever feels right. There is nothing quite as lovely as cracking through the sugary crust of crème brûlée. It’s like unwrapping a present. A crunchy, creamy, vanilla present. But you don’t have to limit this lovely topping to making actual crème brûlée. You can give the same crunchy caramel treatment to cheesecake. It's rich and creamy enough to evoke crème brûlée but with a little tang from cream cheese. This is lovely on it’s own, but even better with a sweet-and-sour cherry topping. Baking the cheesecake in a water bath provides gentle, even heat and helps prevent cracking. Heat the oven to 375 F. Line the bottom of a 6” springform pan with parchment paper. Combine graham crumbs and melted butter, mix until well combined. Press crumbs into the bottom of prepared pan. Bake for 10 minutes and set aside to cool. Reduce oven temperature to 350 F. Wrap the outside of the springform pan in tinfoil to make it watertight. Half-fill a large roasting pan with water, making sure it’s big enough to hold the springform pan without overflowing. In the bowl of a stand mixer, beat cream cheese, mascarpone, flour and salt on medium speed until there are no more lumps. Scrape down the bowl and add ½ cup + 2tbs sugar. Continue beating until well incorporated and smooth. Add vanilla and beat briefly. Add eggs one at a time and beat until just incorporated. Pour filling over the prepared crust and set in the water-filled pan in the oven. Bake 45-50 minutes, or until set around the edges with a wobbly centre. Chill the cheesecake in the fridge for at least 8 hours. Run a knife around the outside of the cheesecake and release the sides of the pan. Carefully slide the cake onto a serving plate. Sprinkle 3 tbs sugar over the cake and use a kitchen torch to melt and caramelize it, moving in steady circles over the surface until evenly caramelized. Serve with cherry compote. Combine all ingredients in a small saucepan and simmer over medium low heat. Cook until the cherries soften and the sugar and liquids thicken into a heavy syrup, about 15-20 mins. Allow to cool and spoon over cheesecake slices. 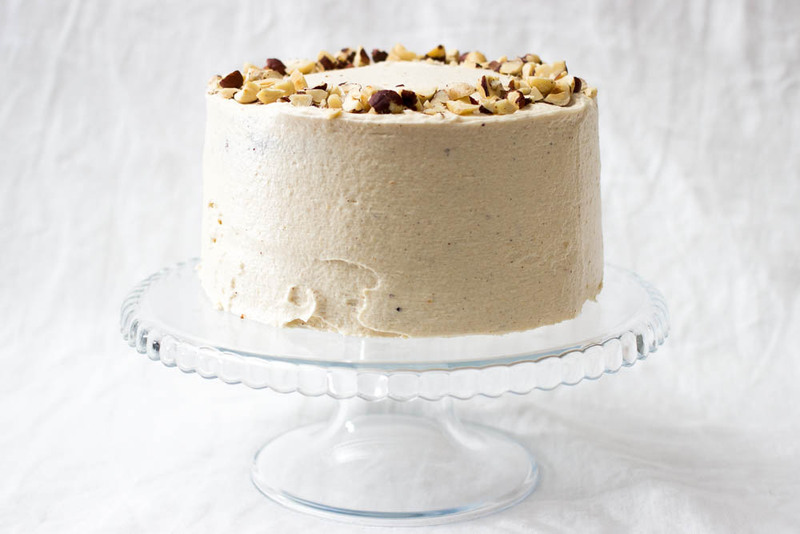 Sometimes you need a casual little one-layer cake, no messing around. And you might as well fold a load of smashed up candy in there, swoop some light and fluffy milk chocolate frosting and some rainbow sprinkles. 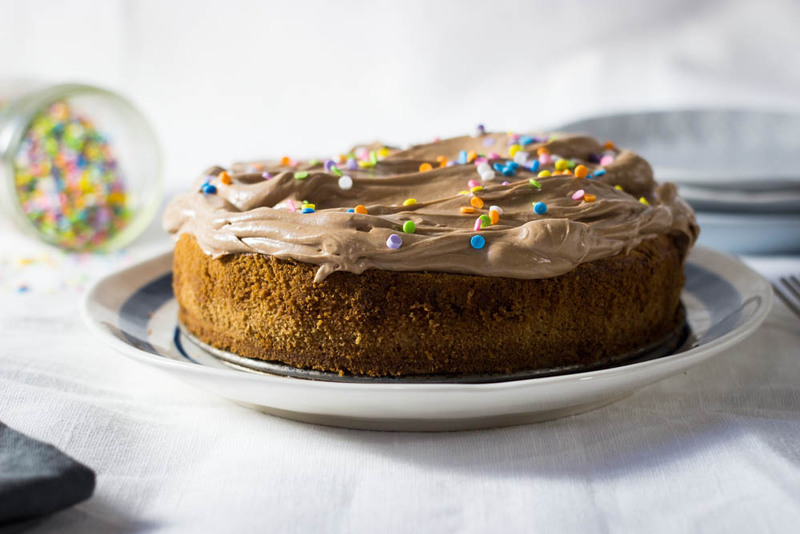 It's only slightly childish to fill a cake with candy, and totally worth it; the smashed malt balls will create melty puddles of chocolate-toffee-ish goodness inside cake as it bakes. This cake recipe makes twice as much as you need. You can just freeze half this batter for later, it never hurts to have frozen cake batter around for an emergency. Or if you want to go big, you could make all the cake batter and make two layers. Just double the frosting. This would be a fantastic birthday cake for children or childish adults. Heat oven to 350°F. Line the bottom of a 6" cake pan with parchment paper. Combine flour, baking powder, baking soda, and salt in a bowl. Cream butter and sugar together in a stand mixer until fluffy and light in colour. Add vanilla and eggs and beat to combine. Scrape the sides of the bowl and beat again until well incorporated. On the lowest speed, mix in buttermilk. Add flour mixture in three additions; a little hand mixing with a spatula to incorporate before turning on the mixer will help prevent flour exploding everywhere. Scrape down bowl well. Pour about 1/2 of the batter into the prepared pan. Bake 25-30 minutes, or until cake is golden brown and a toothpick inserted into the center comes out clean. Set cakes on a rack until completely cool and run a knife around the edge so they come out of the pan cleanly. Reserve half the batter for another use, it freezes very well in an airtight container. Combine cream and golden syrup in a small saucepan, heat on medium until simmering. Pour over chocolate in the bowl of a stand mixer and stir until all chocolate is melted. Set aside until the bowl no longer feels warm at all. Using the whisk attachment mix in butter on medium-high speed until very light and fluffy. Scrape down the bowl to make sure everything is incorporated well. Generously slather the cake in chocolate frosting in big fluffy, pillowy swoops. Sprinkle with rainbow sprinkles all over. Are you looking for a dessert for New Years Eve? Or for any other time? 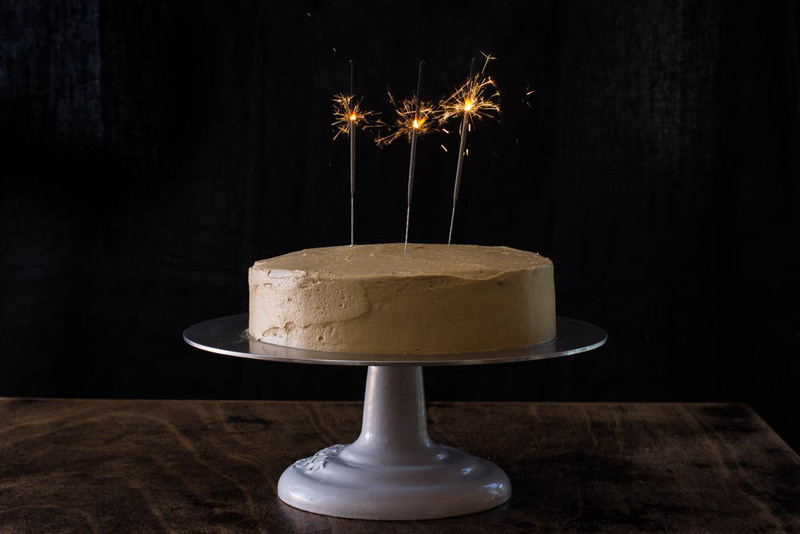 This cake is fancy enough for a big celebration, but it's also appropriate pretty much any time. Rich chocolate cake layers with fluffy, caramelized, toasty, nutty praline, offset with a wee bit of salt. This cake is how you should be ending 2017. 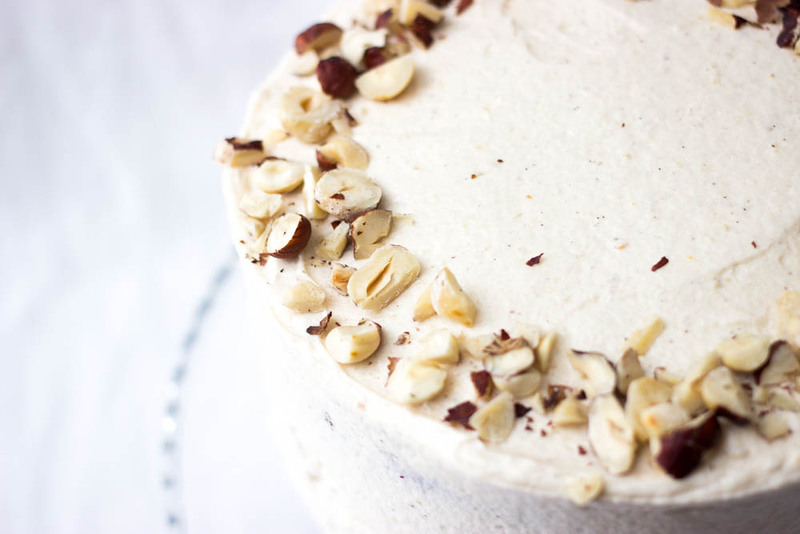 Lately I have been using ermine frosting more than Italian or Swiss meringue buttercream. It has a few different names, boiled milk frosting, flour buttercream...it's just about the weirdest frosting I have ever made, and I think it's also the best. It starts with a flour and milk mixture, cooked up until thick and puddingy. It is flabby and weird looking. It seems like it would make an effective wallpaper paste. It does not seem like it will become a delicious, fluffy, light-yet-rich frosting. But then you cool the milk goop, and whip up some butter and sugar and incorporate the strange goo and it's just magical. The stodgy flour mess becomes so unbelievably fluffy and light, it's utterly transmogrified. You have to try this frosting, it will win you over. Promise. Note: this makes about twice the cake batter you will need. You can either make a huge cake, or freeze the extra for later. Heat oven to 325°F. Prepare 3 6 inch cake pans, either butter or line with parchment. Combine sour cream, hot water and coco in a small bowl, mixing well. Combine flour, baking powder, baking soda and salt in a medium bowl. In a stand mixer, beat butter and shortening on medium speed until fluffy. Add sugars and beat for another 5 minutes. Add eggs one at a time, scraping down the bowl between eggs. Alternating, add flour and coco mixtures in three additions each. Mix on low until well combined. Using about half the batter, divide evenly between prepared pans. Bake until a skewer inserted in the center comes out clean, about 40 minutes. Set cakes aside to cool. Toast nuts in a pan over medium-low heat, shaking them frequently. When they are toasty-coloured and fragrant, remove from heat and place nuts on a parchment lined baking sheet. Melt sugar and water together in a small pan, swirling until it is a medium amber colour. Pour over the nuts. Let cool and smash up into rubble. Blitz in a food processor with the salt, if you have a mini food processor it will be a bit easier. It takes quite a while to get the praline to form a paste; keep on pushing the mix down into the bottom and blending until it stops looking sandy and forms a slightly oily paste. Be patient, it will work eventually. Combine milk and flour in a small saucepan over medium heat. Stir continually until the mixture thickens to a pudding-like consistency. Let cool completely. In a stand mixer, whip butter and sugar for about 2 minutes, until pale and fluffy. Add in milk mixture and beat until the mixture is very light and fluffy. Add praline paste and beat until well incorprated. Note: If the flour mixture or butter are slightly too cold the frosting may not want to come together and stay kind of grainy and wet looking. I solved this by passing a blowtorch with a low flame rapidly around the side of my metal (not glass!) mixing bowl, while whipping on high. If you don't have a blowtorch, I think a hairdryer on hot or a very hot towel wrapped around the base of the bowl would work too. You want to use the heat just until you see the mixture come together and become visibly fluffy. Don't keep the heat on after or you could melt the butter too much. Trim cakes as required to flatten the tops. 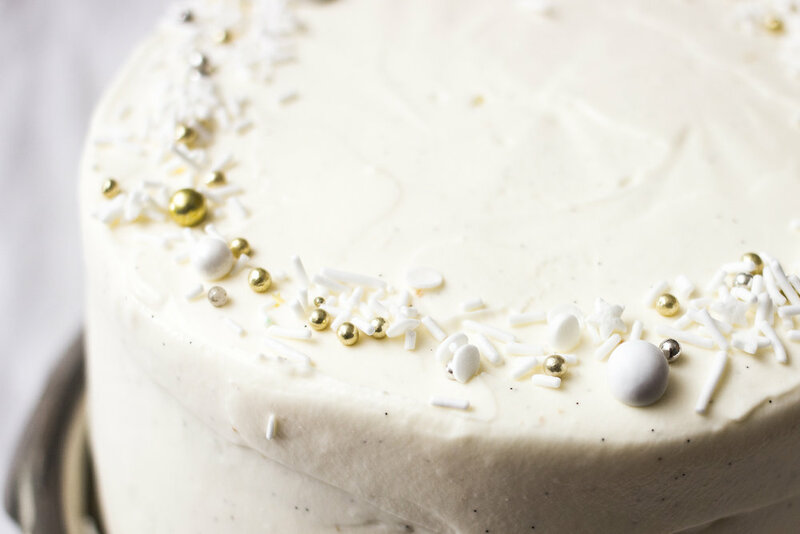 Place one cake layer on a 6" cake board if you have it, or a flat plate or cake stand. Cover cake with a generous layer of frosting. Sandwich next cake layer on top and frost, repeat with the final layer. Chill the cake to set the frosting in the layers. Put a couple skewers through the cake if the layers are sliding around. Frost the chilled cake quickly all over with an offset spatula, making sure to cover all exposed cake. Adding more frosting as you go, use an offset spatula, or bench scraper to tidy up and give the cake some nice clean angles. 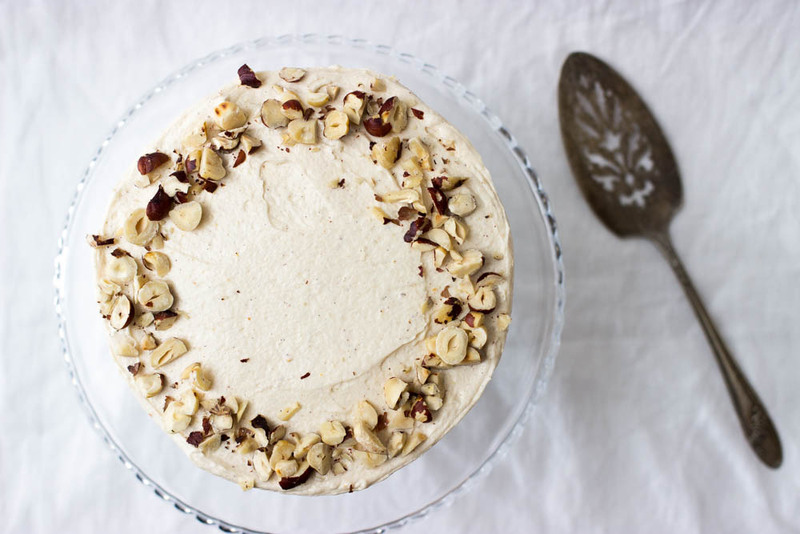 Sprinkle a few chopped toasted hazelnuts around the top of the cake. Practice saying "Yes I made the praline myself." with just the right amount of humility and a slight glow of pride. Your guests are so impressed. Summer's not over for 6 more days! Just because it has started to rain again and the house is actually cold when I get up in the morning and I have started to look for my coats when I go out, it doesn't mean I am accepting fall quite yet. Even if it feels a bit like fall. There are still good peaches at the market and you should quickly turn some of them into this cake. Anytime in the next 6 days. The end-of-summer peaches are sandwiched between two layers of fluffy, bourbon soaked vanilla cake and slathered with a toasty, not too sweet, brown sugar frosting. The frosting is a little alarming to make. The first step is boiling milk and flour together into a thick goop that looks like wallpaper paste. so appetizing! But frosting magic happens when you whip the cooled paste into creamed butter and sugar. Somehow that wallpaper paste turns impossibly fluffy, toasty and caramelly from the brown sugar, but not too sweet. Heat oven to 350°F. Line the bottom of a 9" cake pan with parchment paper. On the lowest speed, beat in buttermilk. Add flour mixture in three additions. Hand mix with a spatula to incorporate before turning on the mixer will help prevent flour exploding everywhere. Scrape down bowl to make sure there are no unmixed spots. Pour about 1/2 of the batter into the prepared pan. Bake 25-30 minutes, or until cake is golden brown and a toothpick inserted into the center comes out clean. Cool cakes and run a knife around the edge so they come out of the pan cleanly. Reserve half the batter for another use, it freezes very well in an airtight container. Combine everything in a small saucepan on medium heat and stir until sugar dissolves and peaches just start to soften. Strain peaches away, reserving them for the filling, and set syrup aside to cool. Combine ingredients and chill until ready to assemble. Combine milk and flour in a small pot and whisk constantly over medium heat until very thick. It will take around 8-10 minutes and will change quickly from thin and milk-like to a very goopy paste. Set aside to cool. When the flour paste is cool, cream butter and sugar for about 3 minutes, until fluffy. Add flour mixture and vanilla and whip until very fluffy, and sugar has dissolved, about 5 minutes. Make sure to scrape the bottom of the bowl well and continue to mix; unincorporated sugar likes to hide out there and make everything go all streaky and separated. Trim any rounded top off the cake to make it flat and level. Trim off the sides if you wish, so that there is no crust on the outside of the cake. Carefully cut the cake in two layers using a bread knife, place one layer on a cake turntable or stand. Drizzle the peach syrup evenly over both cake layers. Let it soak in for about 5 minutes. Pipe a thick wall of frosting around the outside on the bottom layer of cake, and spoon the peach filling inside in a thick layer. Carefully place the top layer onto the cake and chill for about 30 minutes to firm up. Quickly frost the chilled cake all over with remaining frosting (you may want to re-whip it for a couple minutes before frosting) and smooth using a bench scraper or offset spatula. The cake should be refrigerated if you aren't going to eat it right away, but allow to come to room temperature for at least 2 hours before serving.